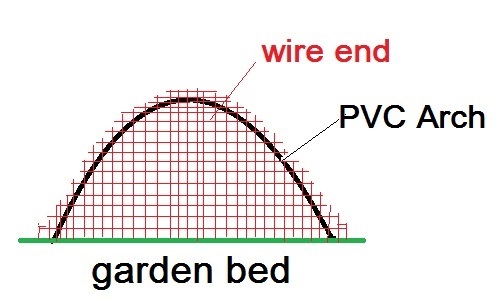 Last time we ran through the basics of building a cage for your veggie bed using PVC pipe and chicken wire or hardware cloth. The bed cages that I built this year fell into two categories – beds that would essentially be left alone until next year and beds that would be harvested within a few weeks. This year I wanted to add some more perennials to the garden, and I chose asparagus and rhubarb. I decided to create a new bed for the asparagus and convert an existing bed into a rhubarb patch. The asparagus bed would not require anything except occasional weeding until next year, and the rhubarb bed, which was actually rhubarb at one end and Swiss chard, onions and herbs at the other, would require weeding and the ability to harvest vegetables and herbs when needed. Initially both beds were treated the same. A PVC frame was put in place and hardware cloth was wired into place on the frames. 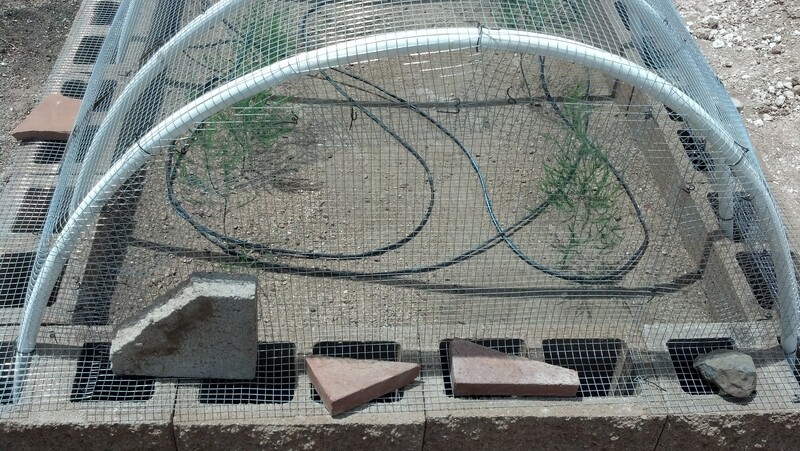 The irrigation for these beds was carefully put into place before the wire was closed up. 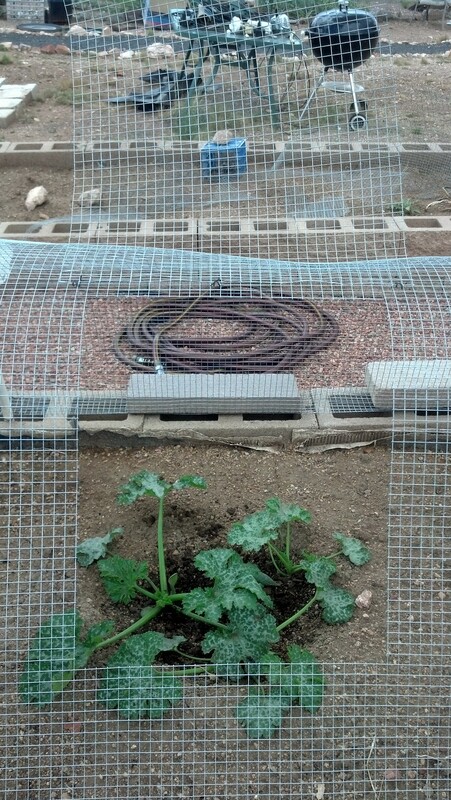 In the case of the asparagus bed I used drip irrigation and the rhubarb bed is a wicking bed (think self watering planter with the reservoir underneath). Once the “arch” frame of the bed is completed you will need to close up both ends of the “cage”. I usually just measure a length of wire fencing that is about 6 inches longer than the widest portion of the “arch” and about 3 to 4 inches taller than the arch. 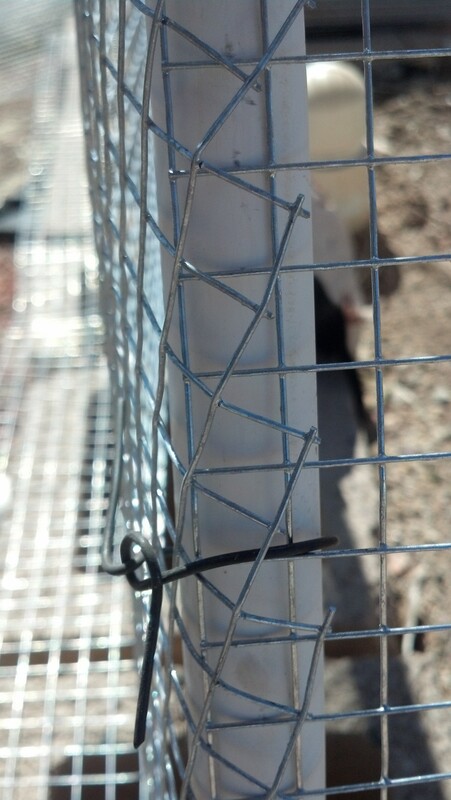 The “end” of the cage is then trimmed to match the arch of the PVC pipe. The “extra” wire is bent down to meet the wire fencing on the arch and then wired in place. When you put the ends on the cage I recommend leaving extra wire at the bottom so that you can anchor it, either on the surface of the soil, or on the edge of the bed. This picture shows how I bend the hardware cloth or chicken wire down and weigh it down on the top of the cement blocks that make up my beds. I leave at least an extra 4 to six inches of wire on all pieces of the wire, all around the bed. OK, so now we have a closed cage. How do we get back in to weed and harvest? Doors! It is possible to open the actual pieces of wire fencing by unwiring them from the PVC pipes, and I have done that before for weeding, but for easy everyday access, you need to make doors. This picture shows the simple doors that I cut into the cages. I choose locations that will allow me to reach the most important areas easily. I cut the wire so that there are as few sharp points sticking out as possible. The hole must be big enough for good access. I cut a piece of wire, in this case hardware cloth, that is at least two inches larger, on each side, than the hole. The hinges are simple loops of wire at the top of the hole that allow the wire door to open and close. To keep the door closed when you are not using it, you can use binding wire or twist ties. Simple! I hope that this series of blogs inspires you to develop your own custom cages to protect your plants.